Dubai: Luis Carvajal Jr. has warned Imperial Hint’s rivals in the $2.5 million Group 1 Dubai Golden Shaheen sponsored by Gulf News that his horse is so fast “the first time I worked him I thought I was going to get a speeding ticket”. The six-year-old son of Imperialism is not the tallest of horses and is likely to be the shortest of the 10 lining up for the 1,200m dirt sprint, but he is said to be frighteningly fast and has upped the ante with Carvajal Jr. underlining his reputation as a speed demon that is happy to get down to business when on the track. Imperial Hint snapped three awards at the recently held Florida Thoroughbred Breeders’ and Owners’ Association awards in Ocala where he was declared Horse of the Year, Champion Older Male and Champion Sprinter for 2018, a year in which he won four of his six starts, including two Grade Ones. Imperial Hint was shipped to Dubai for the race two years ago but things didn’t go according to plan and he had to be withdrawn after falling sick on his arrival. But with his worst behind him, Carvajal Jr. truly believes he has a potent rocket on hand, which he will ignite on Saturday night. “We have a small stable and it’s really hard for us to find these kind of horses. I got really lucky to find one like him. It doesn’t happen all the time and if it does happen it happens when you are 60-70 years old. I’m not that old yet but I just like it that I have him now,” the 46yo conditioner said. “I think not a day goes by when I sit back and think of what this horse has done for me and for my family and the owner (Raymond Mamone) and it’s just been a great journey. 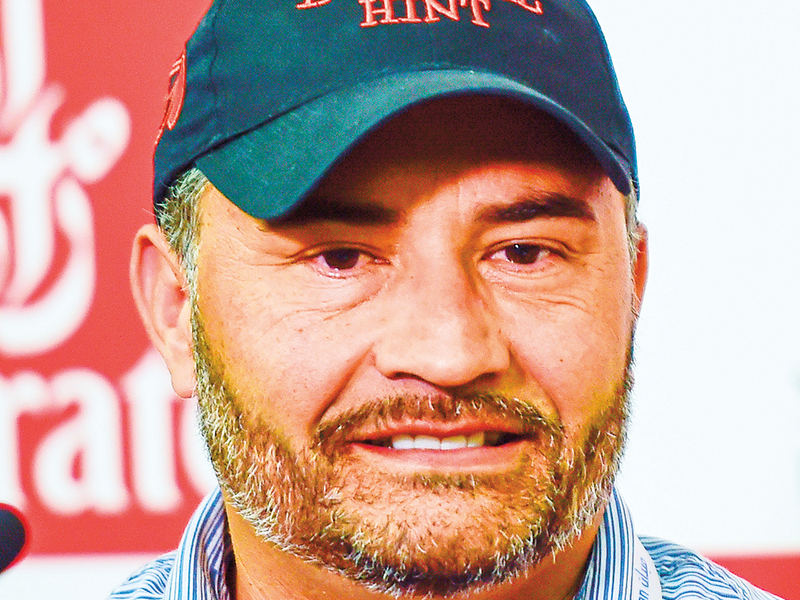 Trainers are often identified by their horses and when Carvajal Jr. is spoken about in racing circles in the United States, he is often referred to as the man who trains Imperial Hint. Chilean born Carvajal Jr turned to training horses after seeing his dreams of being a jockey fade as he grew in size. He had learned to ride from his jockey father in Chile, and thereafter picked up training during a 10-year stint as assistant to Robert Durso in Florida. Now in his 13th year as trainer, Carvajal Jr. is looking to land perhaps the biggest prize of his career. With the cream of the American dirt sprint crop here in Roy H, Promises Fulfilled and XY Jet and further strong names like Tato Key and local star Drafted, the going is bound to be tough. Carvajal Jr believes his Imperial Hint, who was third behind Roy H in the Breeders’ Cup Sprint in November, is ready. “It’s definitely a tough race, we have some of the best horses in the field here and one of the best sprinters in the world with Roy H and XY Jet, who always runs well here, but at least we don’t have Mind Your Biscuits,” he joked. “Jose Ortiz is on my horse so I know he is in good hands and I’m sure he will make the right decision. I would like to be close to the pace and not let XY Jet get away from me. I wanna be right behind him.